Even though the Hungarian prime minister took a more moderate tone with respect to German Chancellor Angela Merkel prior to the elections, as her re-election seemed to be a foregone conclusion, most possibly Viktor Orbán will remain a fierce opponent of the chancellor and seek to challenge her leadership. According to the Fidesz narrative, Merkel comes in for criticism as a symbol of liberalism, for her “migrant-loving” policies, and for her federalist approach in EU matters. Since the outbreak of the refugee crisis, the Hungarian prime minister has been making unprecedentedly harsh statements against Germany’s political leadership and businesses. The European Court of Justice (ECJ) ruling on the temporary quota mechanism could further strain these tensions between Budapest and Berlin. As expected, the ECJ rejected the Slovak-Hungarian lawsuit against the European Union’s mandatory quota scheme obliging them to relocate asylum-seekers from Greece and Italy. Even though the Hungarian prime minister had previously stated Hungary would not accept asylum-seekers under any circumstances, Orbán unexpectedly announced two days after the ruling that he agrees with the view of his Slovak counterpart, Robert Fico, who has stated that while the Slovak government fully respect the verdict, they still insist that the quota scheme is unjust. Regardless of this fact, the Hungarian government does not consider the decision to be legally binding and is refusing to accept a single refugee under the quota system. Moreover, as Minister of Justice László Trócsányi has said, Hungary will face new legal battles in the future. Regardless of the international scandal this will cause, the Orbán government expects this position to yield political benefits domestically in the campaign ahead of Hungary’s April 2018 parliamentary elections. Angela Merkel has addressed the Hungarian government’s response to the ruling twice. First, she declared that Budapest’s refusal to acknowledge the ECJ verdict on the quotas is unacceptable. Second, she indicated in an interview with the German daily Frankfurter Allgemeine Zeitung that she sees differences in the approaches taken by the individual Visegrád Group (V4) states, emphasising that Slovakia and the Czech Republic seem to be more flexible, and therefore she believes it would be “reasonable to talk with each government separately”. This might further weaken the V4’s semblance of unity, which has been shattered on a range of issues and has become even more precarious due to ECJ ruling. The fact that the Czech Republic and Slovakia are more willing to cooperate and less interested in confrontation than the Hungarian and Polish governments provides hope and room for manoeuvre. As Chancellor Merkel is one of the symbols of the refugee quotas in Hungary, this issue could exacerbate existing policy disputes between Budapest and Berlin. A counterpoint to Merkel in Europe? The Hungarian government and its media have portrayed Merkel as a symbol of a decadent liberal elite who are causing the downfall of Europe by inviting millions of refugees to settle there. According to the dominant narrative on the Hungarian right, Merkel’s selfies with refugees are the main driver of the refugee inflow to Europe. Also, Merkel’s governance in Europe, branded a creeping federalist agenda, is described as an existential threat to national sovereignty. The “year of rebellion” which Orbán had expected for 2017 has not materialised thus far, and the strengthening of mainstream (including liberal-conservative) forces and especially the Macron-Merkel axis have opened new possibilities in Europe that run counter to the Hungarian prime minister’s ideas for deeper cooperation within the Eurozone and the emergence of a multi-speed Europe. Despite the fact that Germany is Hungary’s most important economic and political partner, the “illiberal state” in Hungary had already damaged bilateral relations by 2015. Differing opinions on migration and mandatory quotas only aggravated this problem, and high-level bilateral meetings have been rare. In 2014, no high-ranking German official visited Hungary to celebrate the anniversary of the border’s opening in 1989, and Merkel’s visit in early 2015 was strained. A diplomatic source revealed that during the Madrid meeting of the EPP in October 2015 Merkel reproached Orbán for slowly “becoming her strongest opponent” despite the fact that they are theoretically strategic allies and both belong to European People’s Party (EPP) at the EU level. Although Viktor Orbán has rarely attacked the chancellor directly, he has consciously waged a war of words against her policies. Domestically, he has used this to depict himself as an important international actor, as someone equal to Merkel in the eyes of the Hungarian public. He speaks about himself and his followers speak about him as the saviour of Europe, a protector of Christian values, who alone understands the language and the will of the people. In a recent interview, President of the National Assembly László Kövér, Orbán’s close ally, accused “centre-right parties in certain countries” of giving up on conservativism and Christianity and surrendering to liberalism. He even asked rhetorically when Merkel’s party, the Christian Democratic Union (CDU), would change its name from “Christian” to “Centre”. On the European level, the prime minister has tried to introduce a new type of (populist and anti-immigration) conservativism in opposition to Europe’s mainstream centre-right, in hopes that this policy agenda will become dominant in Western Europe. He has often criticised Merkel to mobilise his constituency by appearing as an internationally prominent figure: the anti-Merkel of Europe. Indeed, Orbán’s ideology and rhetoric are much closer to those of the Alternative for Germany (AfD) party with respect to migration as well as other issues. When an intense conflict erupted in 2015 between CDU and its Bavarian sister party, the Christian Social Union (CSU), Orbán openly challenged Merkel’s position, “interfering” in German domestic politics by siding with CSU and indirectly but harshly criticising the chancellor. 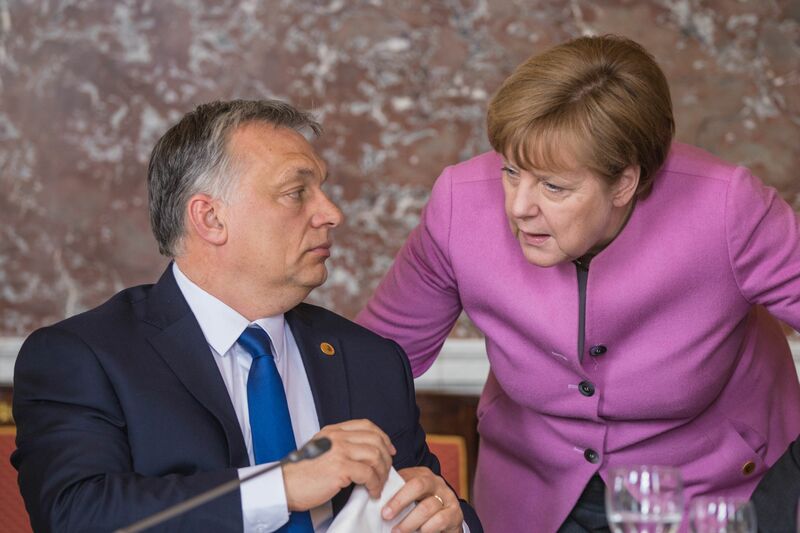 Gerald Knaus, head of the European Stability Initiative think tank, believes Orbán had hoped to replace Merkel as Europe’s leader by opposing her line and stirring up anti-Merkel sentiment subtly, without mentioning her by name. In much the same manner as Russia’s Kremlin-controlled media criticised Merkel and referred to her in a discrediting way until as recently as the spring of 2017, government-organised media outlets in Hungary usually depict the chancellor in a negative light, as a leader whose open immigration policy has flooded the continent with illegal migrants who are out of control. Is Orbán safe from Merkel? Although Germany has repeatedly voiced its concerns that Hungarian government practices are undermining the rule of law, it has refrained from intense, open criticism and diplomatic offensives. This behaviour is underpinned by rational economic and political considerations. German actors are fundamentally interested in political and economic stability in the region. From the German perspective, Hungary currently seems to be stable. The Orbán government has generally followed Germany’s line in foreign policy (despite harsh rhetoric, e.g. votes on sanctions against Russia in the EU Council), and its budgetary rigour and image of economic stability presumably mirror the views of the German government as well as German companies, which make huge profits in Hungary and have good relations with the government. Last but not least, seven months ahead of Hungary’s next parliamentary elections there seems to be no alternative to Fidesz. Indeed, from the perspective of Germany’s foreign policy decision-makers, Fidesz might very well be the least bad option in Hungary, given the fragmented liberal and left-wing opposition landscape and the fact that far-right party Jobbik is now Hungary’s second-strongest political force. Even though until recently Merkel had ruled out financial penalties as a means to compel recalcitrant member states (including Hungary) to fall into line on the quota issue, she seems to have adopted a stronger position in the run-up to the German elections, most probably due to clear demands from the Social Democratic Party (SPD) and Orbán’s refusal to implement the quota ruling. Just recently, Merkel stated that there should be financial consequences for member states that reject solidarity. The official position and tactics of the next German government remain to be seen, however; among other concerns, cuts in EU funding might negatively affect Germany as well. Such a move would seriously undermine positive public sentiment about the EU and Germany in such countries, which could in turn play into the hands of Eurosceptic forces. EU funding cuts could also negatively affect German companies based in Hungary – or at least this is the most recent argument (threat?) brought up by the Hungarian government in the dispute. According to a statement by Hungarian Foreign Minister Szijjártó, German companies are “carving a big slice out of the EU funding that arrives in Hungary”. Germany’s governing CDU/CSU party is Fidesz’s ally in the EPP, and they continue to provide a protective umbrella to Fidesz. This was in evidence at the vote in May on triggering the Article 7 procedure, when only two out of 34 German MEPs in the EPP voted in favour with five abstentions. CDU/CSU MEPs continue to side with Fidesz in such votes presumably because the 12 Fidesz MEPs are important for securing the EPP’s majority in the EP. Conversely, expelling Fidesz from the EPP would further weaken the already seemingly minimal potential to influence its actions. Another risk is that Fidesz might strengthen the Eurosceptic camp after a putative expulsion from the EPP, whereas at present EPP membership still plays a minimal moderating role. After seeing the consolidation of CDU’s and Merkel’s position since early 2017, Orbán has softened his anti-Merkel rhetoric. At the final event of the National Consultation entitled “Let’s stop Brussels” in June, Orbán asked the audience to “say a quiet prayer for the victory of Angela Merkel. Yes, serving the nation sometimes also requires personal sacrifice.” Nevertheless, Orbán continues to try to be the counterweight to Merkel’s immigration policy. For example, at the EPP’s Malta meeting in late March, he sharply criticised EU policy during the refugee crisis. Merkel’s soft attitude can be partly explained by the Realpolitik of German business and industrial interests, and partly by her personal political style. She believes in finding compromises through rational debate, and prefers to avoid fierce, theatrical verbal exchanges. Thus, she is the complete opposite of Orbán, who strives for polarisation and seeks confrontation. This is probably also part of the reason why Merkel has avoided a direct confrontation with Budapest, and has instead emphasised solutions at the EU level. But these take time and the stakes are high: Orbán is working to undermine both the EU’s system of decision-making based on mutual compromise and Germany’s political influence in the region by increasingly speaking out against it. Orbán was vocal about his hopes that Germany could undergo a “revolution” as well – in other words, that Merkel would be swept from power and possibly replaced by the AfD. Furthermore, since 2010 Hungary has abandoned almost all of the elements of Germany’s consensus democracy which it had previously adopted. The government has ignored the opposition, weakened the Constitutional Court, changed the electoral system and undermined media freedoms. With the advent of official, state-organised attacks against NGOs (many of them cooperating with German partners), Hungary has accelerated its assault on the core values of the EU and Germany. And as the case of Poland indicates, Hungary’s illiberal policies are having a clear spill-over effect in the region. Orbán and Kaczyński are doing their best to destroy Germany’s positive image in Central Eastern Europe, depicting Germany as the capital of the decadent, liberal, pro-immigration EU that is doomed to fail. For this reason, tolerating and encouraging Hungary’s behaviour for the sake of short-term economic and political interests would be a huge long-term strategic mistake for Germany – a point that is worth considering after the German elections. This article is part of our dossier "Focus on Hungary". In Hungary, NGOs are now required to register as “civic organisations funded from abroad” if they receive financial support from a foreign source. The government is trying to delegitimise any organisation that criticises certain government policies, says Veronika Móra.